After 8 hours of research evaluating 355 products, we picked 2 Carat Eternity Diamond Wedding Ring - Luxury Collection as our top choice. The engagement ring is what gives people dreamy eyes, but the wedding band is what symbolizes the true meaning of marriage. A ring has no beginning or end - it's endless and eternal, like love. Considering your options? Wedding rings for women are typically less expensive than engagement rings and complete the set! What's her dream ring? Should I go with something more classic or eclectic and modern? Does she want something with a stone or something simple? Well, ask her! And then consult this list, because we've gathered some of the best wedding bands for women and tucked them into this article. Wedding rings for women can be made of just about anything nowadays, and her perfect ring depends on budget and preferred design. Now, let's help you find the perfect ring at the perfect price. Trust us, you'll need every penny saved for that perfect wedding! Hello, value! The 4 "c"s of diamonds are all present here: excellent color, cut, clarity and carat weight... for a fraction of the price you'd pay at a brick-and-mortar jeweler. This particular ring only comes in yellow gold. You can choose from related items, or after a ton of research, this one is similar and a great value. This gorgeous ring is channel set. A channel setting is a secure way to set petite diamonds closely together into the band, creating a sparkling row that's flush with the band. Conflict-free and 100% natural white diamonds grace the top half of this ring. The diamonds are untreated and a very good cut round brilliant. The gold setting is 14k, which is a beautiful color - not too overpoweringly yellow! The lifetime warranty on the women's wedding band offers product maintenance, servicing and any required resizing, polishing and finishing. Plus, if you're not happy with the purchase for any reason, there's a 30-day money-back guarantee - no questions asked. You'll pay so much more for the same ring in a jewelry shop! There's no reason to pass this up. Unique wedding rings are very on-trend right now, and this gorgeous sapphire wedding ring for women will steal the show. Make sure this is what she wants before you buy it! Gemstone rings are beautiful but very personal. Also, it doesn't come with a box. People love sapphire for its elegant and vibrant color. Instead of a plain gold band or an all-too-common diamond wedding ring, why not opt for a ring that's as unique as she is? Seven breathtaking sapphire gemstones line the top of an 18k gold band. The round gems are cut in a brilliant style. The gemstones are all natural and mined from some of the most exotic places on earth. It takes nature millions of years and precise climate conditions to create gemstones. Because of this, each gem is as unique as the person you're giving it too. Sapphire is a durable gemstone that fits the bill for everyday wear. The sapphire symbolizes wisdom, virtue, good fortune, faithfulness, sincerity, and holiness, so that makes it the perfect gemstone to say "I do!" Sapphire scores a nine on the Mohs Scale of Hardness (a diamond scores 10). The gems sit on top of 18-carat gold, which has enough sturdiness to last while still owning a beautiful golden hue. Does she prefer a white gold look? Check out this elegant sapphire and diamond wedding band. Can you purchase a sapphire ring for less money? Yes. But just like diamonds, the price of sapphires changes drastically based on their brilliance. For a piece that's supposed to last a lifetime, it would be a wise move to invest in quality. 16 round diamonds line the top of this thin wedding ring without overwhelming her engagement ring. This ring is petite like it says, so it looks best on small hands. Want a similar ring with a thicker band and bigger diamonds? The Luna diamond ring is exactly what you're looking for. Graced with a Cathedral setting, this petite ring is a pavé band. That means there are a bunch of little diamonds or gemstones fastened in by droplets of metal. It creates a delicate look that will definitely accentuate any engagement ring. Reviewers say this ring looks best on smaller hands, so keep that in mind when purchasing. The total carat weight is 1/6 ct. This ring fits very nicely with a solitaire engagement ring. Looking for more weight and a thicker band? Try this gorgeous 1/2 carat Luna band. Offered in both 18k (75% gold) and 14k (58.3% gold), white gold is fused with other metals for additional strength and durability. It has a natural soft yellow color and may be plated with rhodium, which is a hard, shiny white metal. This is a dainty diamond ring, and you can get 1/6th total carat weight for a cheaper price. But it won't look like this, and the quality of work and diamonds won't be quite as brilliant. Average diamond color is I, which is a fantastic value without minimizing visible quality. The clarity is SI1-SI2, which is average on the clarity scale, but the naked eye can't notice any inclusions. In fact, you'd have to be magnified at 10x to notice any inclusions. This is the best place to cut corners to lower price. Besides, since these diamonds are so small, nobody could notice any imperfections. All that being said, reviewers believe it's well worth the price. An elegant and unique look without being too flashy - the ultimate balance! The diamond quality isn't great, but with diamonds this small, you can't even tell. Plus, it's reflected in the low price. Vintage is so in right now! This sparkly wedding ring boasts round and oval diamonds encompassed by a luxurious milgrain border. Not too flashy, not too plain — the perfect ring for your perfect day! Choose from 10k white gold, yellow gold, or rose gold. 10 karat gold contains 47.7% gold. The rest is an alloy of hard metals like silver, copper, nickel or zinc. The round diamonds are conflict-free and graded I2-I3 clarity and IJ color. That's on the lower end of the scale, but for the price, you can't beat it. Plus, the diamonds are so small that nobody - not even you - will notice any inclusions. If you lose an accent stone, they will fix it for free. The price here is on-point for this gorgeous and novel vintage band, and the ring looks more expensive than it is, which is always cool. Nobody will believe you bought this for her on Amazon! 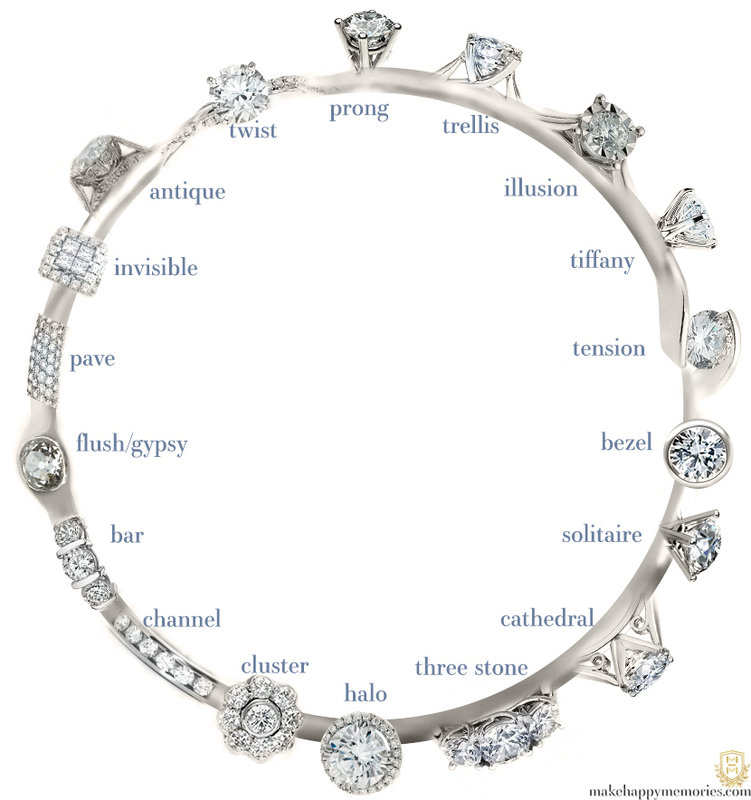 An eternity ring has diamonds all around the band. This gorgeous style is definitely a statement piece! Brilliant white diamonds "ring" this ring; the entire ring is lined with diamonds, per the eternity band style. What's really great about this ring: D-E colored diamonds are colorless or nearly colorless, which is the purest and most perfect diamond in the world! If you're looking for something more grandiose, this 4 carat (total weight) ring is similar but way bigger! Perfect for the woman with a huge personality. Your choice of white gold, rose gold, yellow gold or platinum. The diamonds are natural and untreated. 14 karat gold contains 58% pure gold. In this state, it's too soft to be used in everyday jewelry. That's why it's alloyed with other metals, such as silver, nickel, zinc or copper to increase its durability and strength. For this ring, choose from 14K white gold, yellow gold, or rose gold. You may also opt for platinum. It raises the price a bit, but platinum is the most durable fine jewelry material. It's similar in color to white gold. It doesn't chip or splinter, making it perfect for diamond and gemstone settings. If you are nervous about buying an expensive diamond ring online, don't be: let the stats of the diamonds speak themselves. Round brilliant diamonds, VS1-VS2, very good cut. For this price, it's a steal.